There is a house around here that has a nice shed type thing built in the yard with doggy doors on it and then a fenced in outdoor area for pottying and such. Anyone have an outdoor kennel set up? pictures? We don't have the set up that you are talking about. Yup, we do. Although we don't have it "attached" to a shed type thing, it is out by our garden shed, so it does get offered some protection from the elements. We have a 10'x10' kennel section up against the shed. We put pavers down to keep the dogs out of mud if it rains. The west side of the kennel is up against the shed, and the north side is covered with a tarp so the dog houses are angled in that corner to keep wind/rain/snow out of them. We have a shade tarp for the summer, and there is also room for a kiddy pool in there if needed. We also have it by an outlet so we can hook up a heated water dish for the winter. We also have a 20'x16' kennel area attached to it so we can open up the door and let them have run of that grass area. Honestly, having a little 6'x10' are would have been just fine for bathroom reasons, but we had the panels and I thought we may as well use them. Some neighbors I used to dog sit for used an indoor/outdoor system. 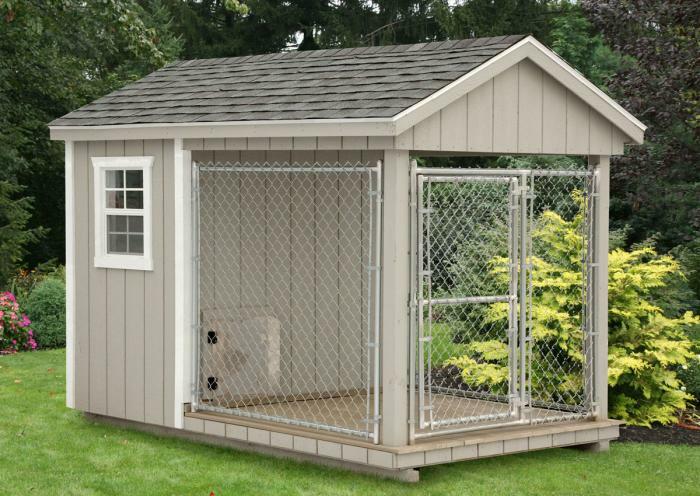 They had a kennel like the one posted above inside their garage, with the sides secured to the wall. A dog door went out from that kennel into a 6'x10' kennel outside, that had pavers down on it to keep the dogs out of mud (because, even if it starts out as grass, if the dogs spend any kind of time in it they will tread it down to mud) and a shade tarp over the top. I liked the set up. My favourite Akita breeder uses outdoor kennels, they are gorgeous. I wish I could find the photos she had showed us back in the Yahoo Chat days. Bluevine Akitas is her kennel name, maybe there are some on her website somewhere? They were beautiful though. Oh ya, you will definitely want concrete, or some type of sub flooring, ESPECIALLY if your dogs are diggers. They will kill the grass very quickly with the digging, walking, peeing, and pooping in one area. Then all you'll have is a mud fest.......yuck! I'm watching this thread closely. I want to put something like this up when we get a dog. My parents have an indoor/outdoor run set up off of their detached garage - they used river run gravel in the outside portion to minimize mud without the hassle of having to pour concrete. The river run packs down quite nicely. Hmmm I will have to remember this. Random, but I think both dogs' favorite place to be is sun bathing on the roof of their dog houses.